Signs proliferate in the modern city, subtly shepherding us the ‘right’ way. We are directed what to do, where and when to do it, what this is, how this or that ought to be understood – all the things that ultimately define who we are. Often their graphic and format are so familiar that they affect a kind of obedient disengagement, effectively stripping us of our capacity for interpretation by suppressing self-directed thought and action. 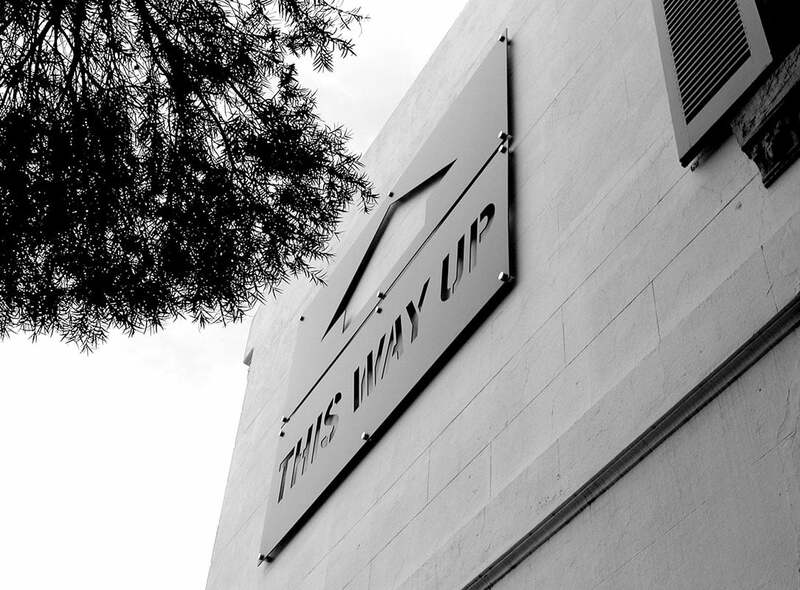 ‘This Way Up’ is no such sign. By presenting a familiar idea at an unfamiliar scale and in unfamiliar circumstances, it’s obscurity boldly demands the engagement of interpretative faculties. In this way, with one stake in the ‘sign’ camp, it firmly drives the other into ‘stencil art’ territory, drawing on the rich sub-culture so productive in Melbourne’s street-art scene. Yet even here it denies convenient categorization. Rather than using the stencil as a template, the template itself is fixed to the side of the house. Is this an original? A stencil template set aside after a long night out on the spray cans? Or is this just another in Australia’s grand tradition of oversized novelty attractions? Usually the reserve of remote country towns, perhaps The Big Stencil is intended to put Melbourne on the map, joining the likes of Coffs Harbour’s Big Banana, Horsham’s Big Koala, Kingston’s Big Lobster, Goulburn’s Big merino and of course that Big Rock at the center of our vast country. Interpretations abound. Once pinned-up it resists being pinned-down. We are accustomed to signs playing very clear roles in our lives, directing us to some mode of action appropriate to the context in which we find them. The ambiguous nature of this particular sign does not allow us to identify it’s context so easily. It faces a road, yet its instruction is ludicrous to passing traffic. 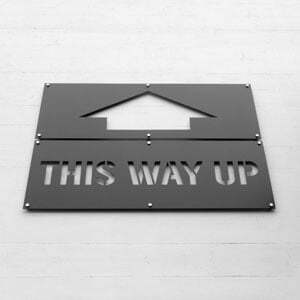 It’s a sign often used in freight transportation, yet it is fixed to a house which was clearly created in-situ. Here is the sign, but how are we to read it? One possible reading concerns the Victorian terrace house itself. 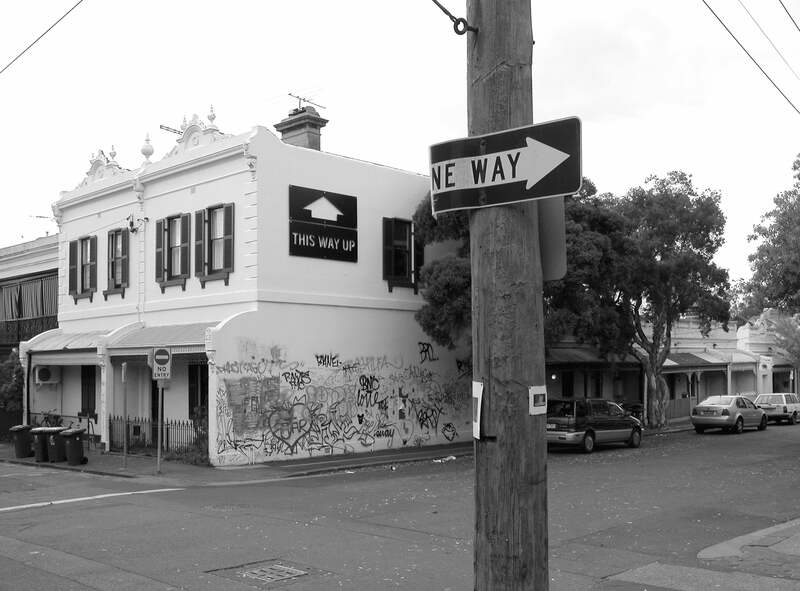 An imported typology, perhaps the sign alludes to their mass ‘transportation’ to Australian shores. The residual marking is testament to the careless manner in which this package has been abandoned without consideration for its future life in the Australian landscape and climate. 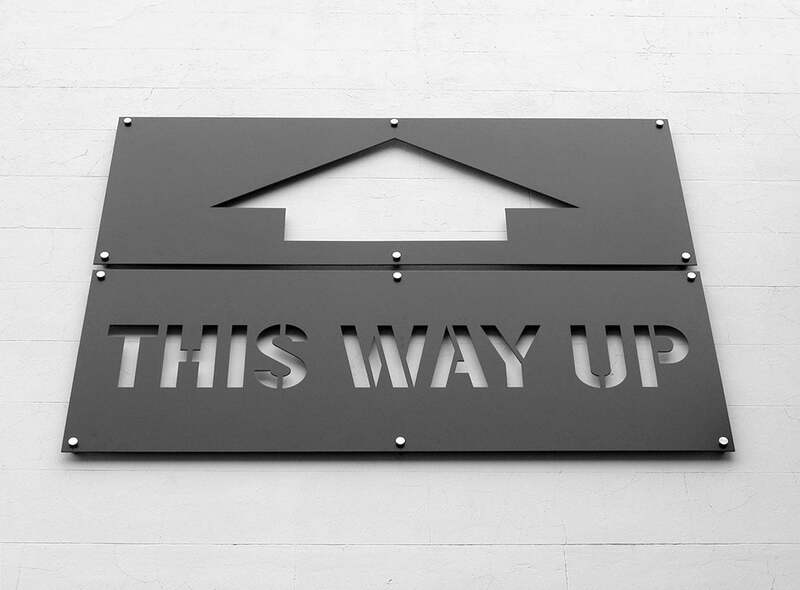 Or perhaps ‘This Way Up’ is showing us the door – pointing to the place in the sky where outdated architectural styles ought to be put to rest. Certainly the stencil suggests that it’s message is as mass-produced and wide-spread as the Victorian terrace house itself. Can we expect to find this branding on others, visible where boundary walls slip past one another and we catch a glimpse of exposed terrace skin? A helium filled structure lighter than the air it displaces, tethered with weighted tension cables, resting on the courtyard surface. A comprehensive external lighting strategy for NGV in St Kilda Road which integrates several components into the heritage fabric of the iconic existing building. An installation with Bridie Lunny to create a series of stages for performance that are carefully intertwined with the daily life of the Sofitel Hotel. To account for varied presentation spaces, we carefully employed materials and objects to create threshold spaces between the gallery and the works. 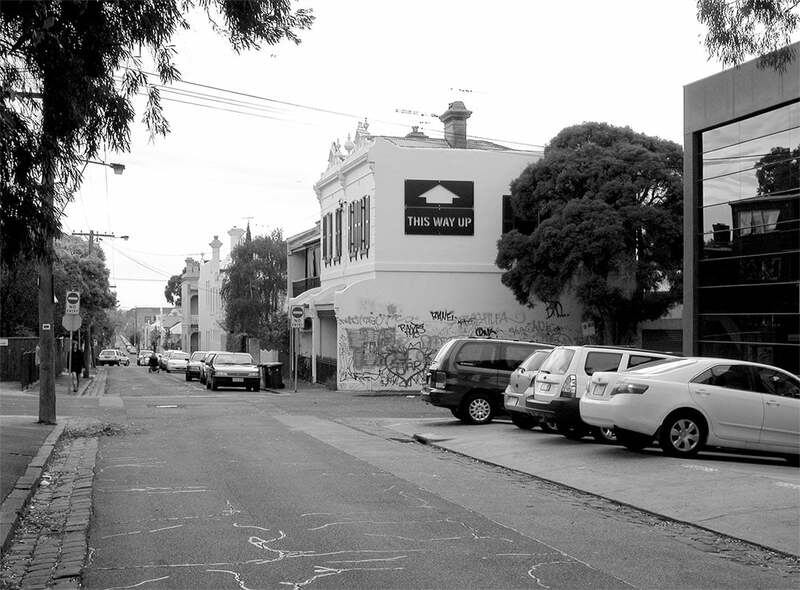 Artistic and architectural responses to Rembrandts; a defunct entertainment centre and a place of memory and significance for its community. Thinking big in a small space: Four projects re-imagine the facade of the Majorca Building in Melbourne's Centre Place. An installation of abstracted drawing boards turns an ex-Army Drill hall into an architecture exhibition space. The pavilion is formed from two supporting devices; the impossible meeting of floor and ceiling planes and the dual shadow volumes cast from the absent.